St Thomas Anglican Church is located on the corner of Church and Mclaren Streets, North Sydney, New South Wales, Australia. Don was Enlisted in the Citizens Military Forces from from 15 December 1941 to 21 June 1942. This photo was taken when Donald first joined up to fight in the World War II. Don Joined the Chatswood RSL on discharge from the Army in 1947. He later transferred his membership to the Caringbah RSL and then to The Greenbank RSL upon moving to Queensland. Don was made a life member of the RSL in 1997 after 50 years continuous membership. He remained a member of the R.S.L. until his death in 2013. 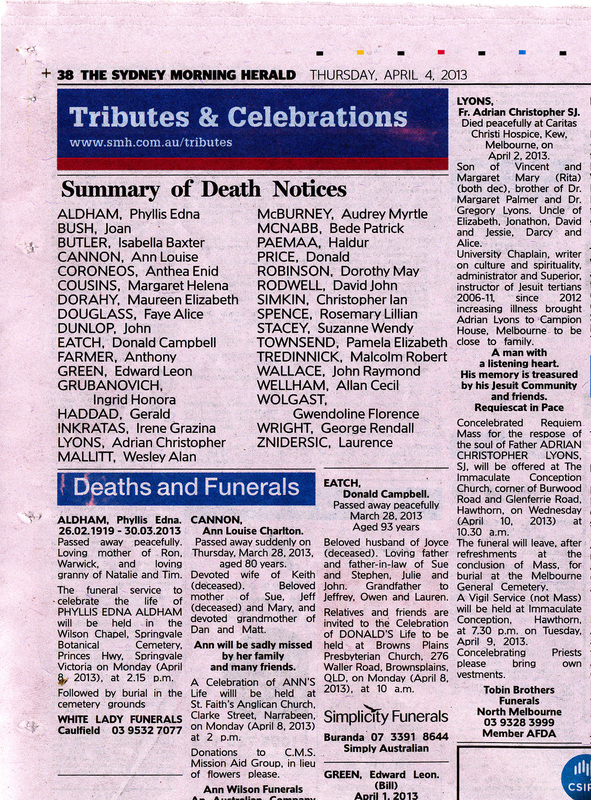 Donald Campbell Eatch Obituary was published in the Sydney Morning Herald, Sydney, New South Wales, Australia on 04 Apr 2013. Donalds Funeral Service was held at the Browns Plains Presbyterian Church at 10:00am on Monday 08 Apr 2013. A piper lead the ceremony and Mr eric Cavanagh of the Returned Services League of Australia conducted the RSL Poppy Service. Eulogy were given by Mr Stephen Burnett and John Tucker (Son-in-law). William Ernest Eatch married Ethel Elizabeth Campbell, 29 Mar 1919 at St Thomas, Church of England, North Sydney. Donald Campbell Eatch and Joyce Rose Butcher, Photograph taken on their wedding day 08 November 1952. Don and Joyce Eatch Celebrated their 50th Wedding Anniversary on 08 Nov 2002. Don & Joyce Eatch (n. Butcher) 50th Wedding Anniversary - Governor General of Australia. Congratulations to Don and Joyce Eatch from the Governor General of Australia on their 50th Wedding Anniversary. 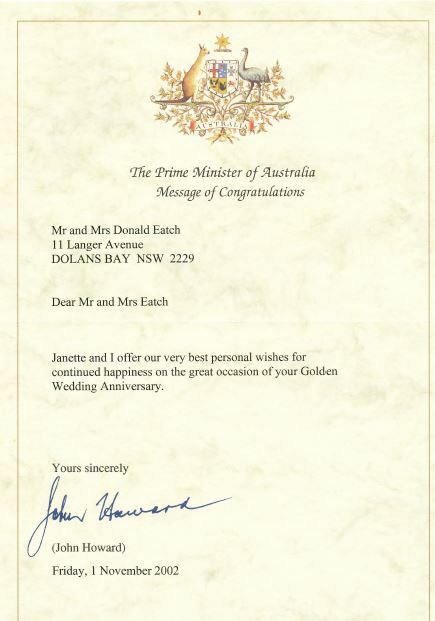 Congratulations to Don & Joyce Eatch from the Prime Minister of Australia on their 50th Wedding Anniversary. Congratulations to Don & Joyce Eatch on their 50th Wedding Anniversary from the Governor of New South Wales. Congratulations to Don & Joyce Eatch on their 50th Wedding Anniversary from the Premier of New South Wales. Congratulations to Don & Joyce Eatch (n. Butcher) on their 50th Wedding Anniversary from the Federal Member for Cook. Don & Joyce Eatch (n. Butcher) 50th Wedding Anniversary - The State Member for Cronulla. Congratulations to Don & Joyce Eatch on their 50th Wedding Anniversary from the State Member for Cook. Donald Campbell Eatch, 1st left, outside his Radio Trailer Kure Japan 1946 -1947 - Japanese occupation force. Donald Campbell Eatch in front of his barracks at Kure Japan 1946 - 1947. Don is third from the left. Donald Campbell Eatch Kure Japan 1946 - 1947 Kure Japan. Destroyed Japanese Heavy Anti Aircraft Gun, Donald Campbell Eatch is second from the left. Kure Japan 1946 - 1947. Don is dressed up in his Blues state of origin jumper ready to watch the state of origin rugby league match between New South Wales (Blues) and Queensland (Maroons). Photo was taken in 2012. Col Elliott interviewed Donald Campbell Eatch, Anzac Day, 25 April 2011, at The Logan Diggers Club, Logan City, Queensland, Australia. To Play the clip you need Quick time 7.0, VLC or similar Program. [S91] Donald Campbell Eatch (Reliability: 2), 1 Jan 1920. I was born at Stanhope Private Hospital, Alfred St North Sydney New South Wales at 10:30pm on 01 Jan 1920. [S91] Donald Campbell Eatch (Reliability: 3). [S34] National Archives of Australia (Reliability: 3), 2010. [S34] National Archives of Australia (Reliability: 2), 2010. Military Service Record - Army of Donald Campbell Eatch. [S91] Donald Campbell Eatch (Reliability: 3), 16 Dec 2010. I joined the RSL on discharge from the army. I was a member of Chatswood and then when Caringbah was built I transferred my membership to there. Caringbah RSL made me a Life member in 1997 after I had been a member for 50 years. [S88] John Robert Tucker (Reliability: 2), 9 Apr 2013. When Dad came to live with us in 2011 he transferred his membership from the Caringbah RSL to the Greenbank RSL Club. They recognized and continued his Life Membership. Dad remained a member of the RSL until his death and was very proud of his Life Membership. [S24] Queensland Births Deaths & Marriages, Queensland Government (Reliability: 3), 9 Apr 2013. See attached copy of Queensland Death Certificate. [MT THOMPSON CREMATORIU] (Reliability: 3), 8 Apr 2013. [S88] John Robert Tucker (Reliability: 3), 29 Mar 2013. 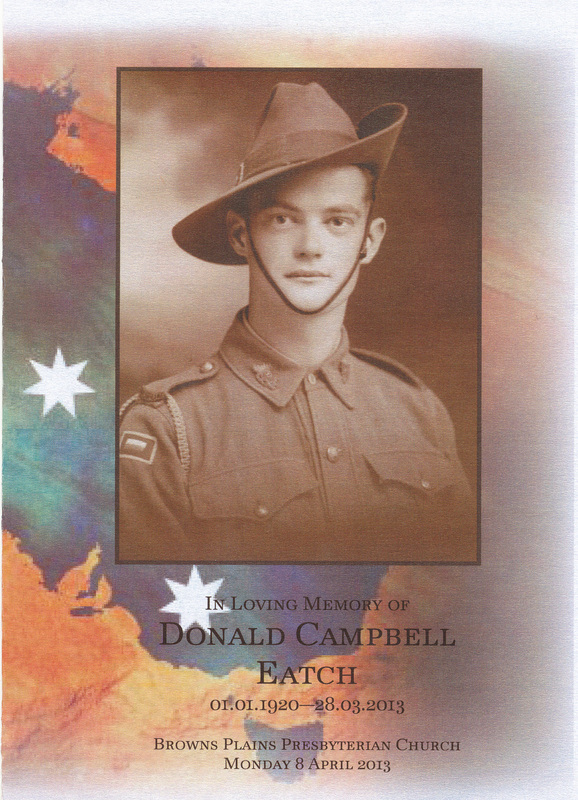 My father-In-Law, Donald Campbell Eatch, passed on at 11:58pm on 28 Mar 2013 at Clive Burdeu, Church of Christ, Nursing Home, Middle Rd, Hillcrest, Queensland, Australia. His Daughter, Julie Rose Tucker (nee Eatch) (my wife) was with him when he took his final breath. Donald was the end of his line. He was the last person in Australia with the surname Eatch. [S88] John Robert Tucker, 08 April 2013. [S481] St Thomas Anglican Church, North Sydney, Parish Records, 150, 29 Mar 1919. St Thomas, Church of England, North Sydney, Marriage Register, Page 150, Marriage No. 300, 29th March 1919, William Ernest Eatch and Ethel Elizabeth Campbell. [S90] Joyce Rose Eatch (n. Butcher) (Reliability: 3). [S89] Julie Rose Tucker (n. Eatch) (Reliability: 3), 8 Nov 2002. Mum and Dad Celebrated their 50th Wedding Anniversary on 08th November 2002. See the attached letters of congratulations from The Australian Prime Minster, Premier of New South Wales, Governor General of Australia, Governor of New South Wales, Federal Member for Cook and State Member for Cronulla.